I cannot accept that it is already Sunday. Today I needed to keep busy. 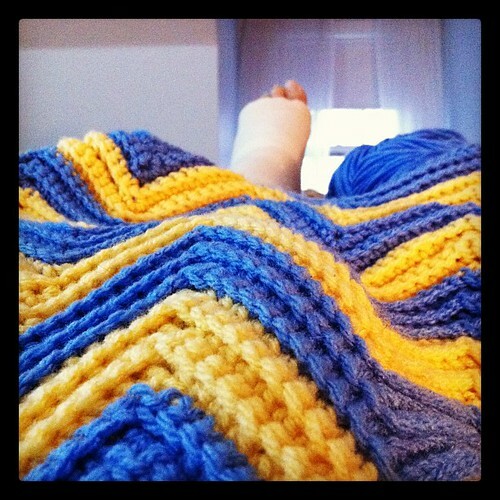 I worked on my crochet ripple blanket for a short while. It’s lovely to have a functional work-in-progress. Already I like covering up with it. I doodles for a bit with the pens a friend sent me in a care package. 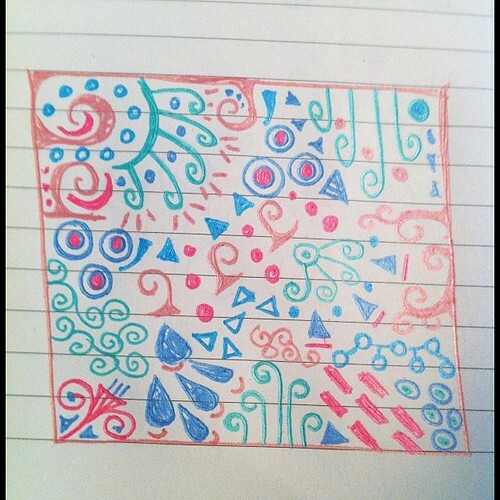 It was supposed to be a sort of Zentangle but I didn’t really follow the rules. It was fun and helped keep my mind away from worries and stressful thoughts. 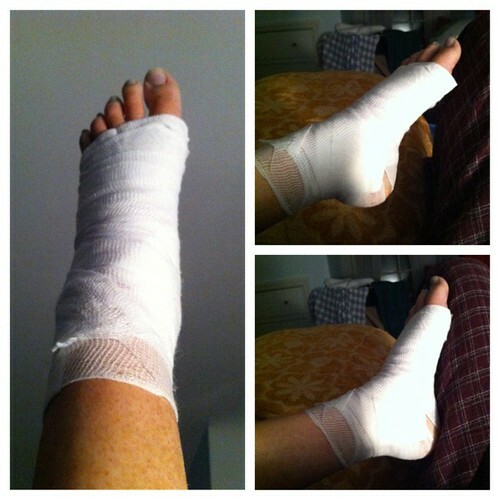 Lastly I worked on angering my ankle. I need to increase it’s range of movement a lot before next week. I’m scared. I’m quite uncomfortable after moving it around gently. I can’t imagine what it will be like if I don’t make progress in the next seven days. I’m very tired of being uncomfortable but I’m more tired of not being able to do things. I hope my ankle takes that as a warning. I WILL MAKE PROGRESS. 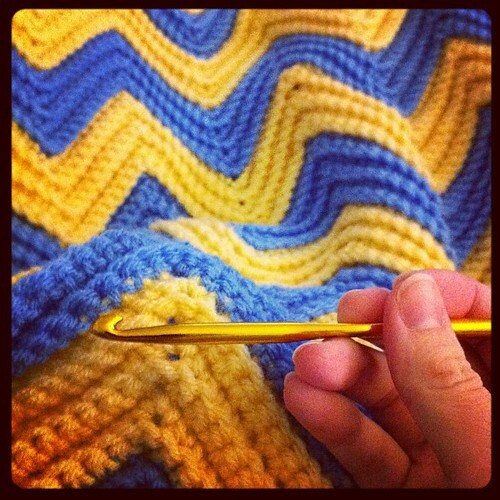 I did work on my crochet ripple blanket for a bit. I sat on our brand new freshly delivered love seat. We ordered it back in September but because of the accident it couldn’t be delivered. But today the new “Chili” colored beauty came home. 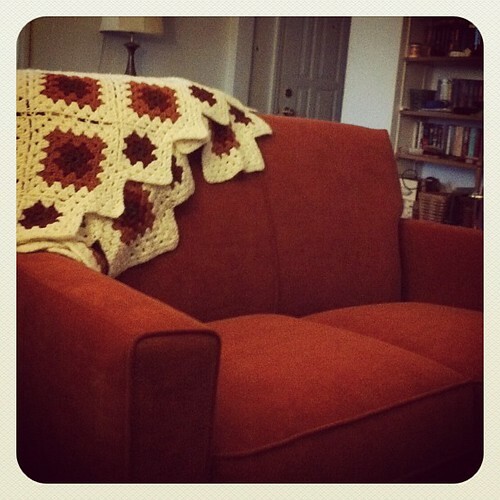 The estate sale granny square afghan I got years ago in hopes of redecorating matches poifectly! But now I need to rest and refocus. Be well. I fell asleep about three hours ago and just woke up to get ready for bed. Such bad habits are developing. I thought of writing a post earlier but I guess this will have to do. 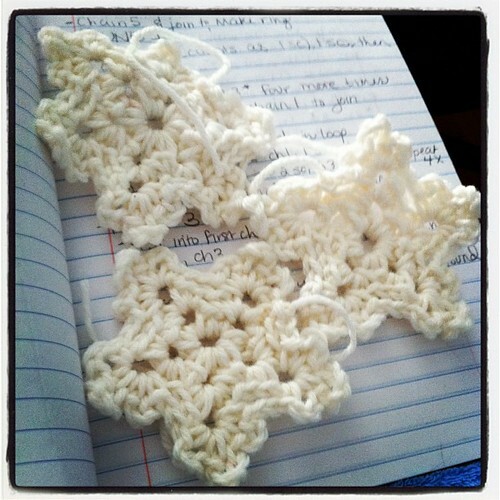 I worked on crochet snowflakes today. I ended up with five total. Slowly but surely things will take shape. Tomorrow I will measure the fireplace mantle and get a better plan for this garland. Now I will return to dreamland. Goodnight and be well. 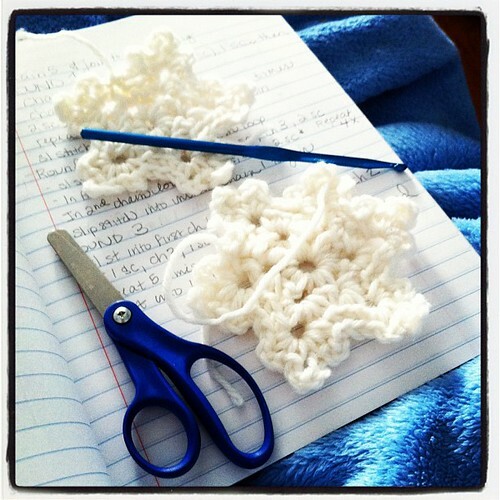 I’ve been thinking about making a crochet snowflake garland. 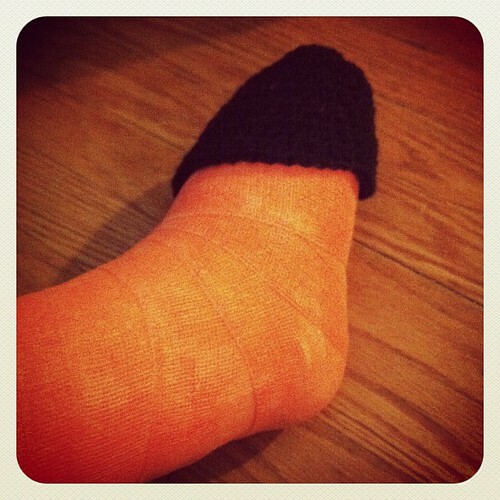 Today I found a cute pattern HERE. 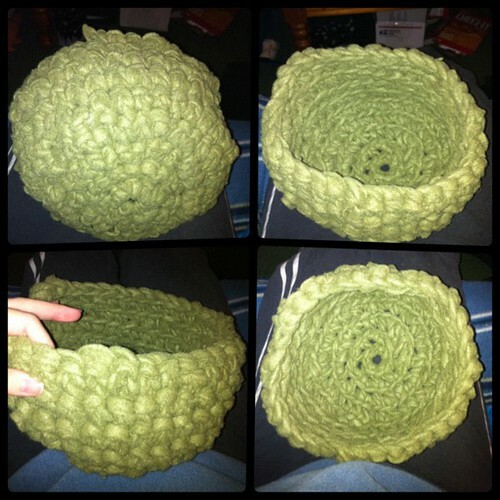 I grabbed my yarn and H hook. 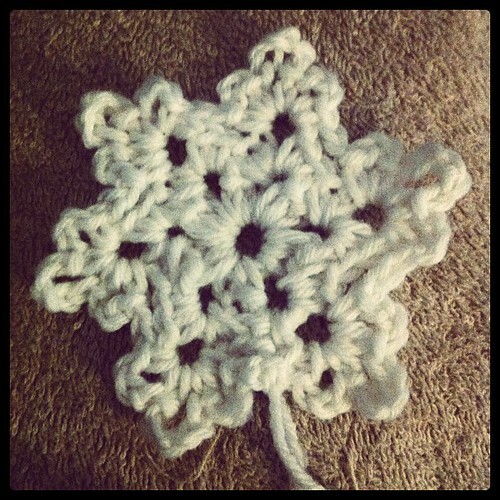 The directions are clear and before long i had my first finished snowflake. I’ll be working on these when I can. I can’t wait to see how these will look strung together hanging on the mantle. Another rough night full of waking and trying to find a comfortable position. I can only really sleep on my back which limits the possibilities severely. I took a shower today. Normally this wouldn’t be something of note but it’s now quite an ordeal. My Mum helps me. She’s been so very selfless and has been my rock through this entire ordeal. I’ve been a bit out of it today. The lose-track-of-time fog swallowed me up good. I can’t even grasp that it’s Wednesday – my brain wants it to be Saturday. 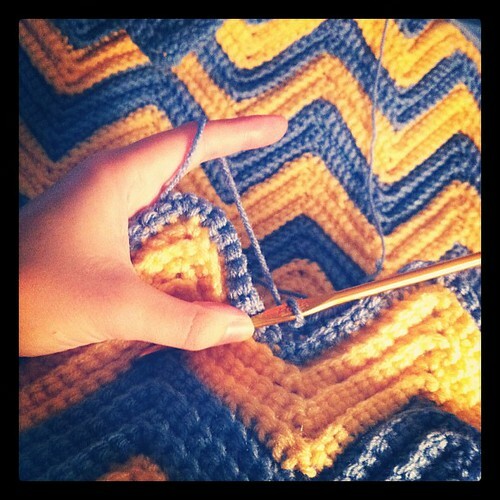 I managed to crochet a bit today on my in-progress ripple afghan though. It was a nice change of pace. I have a bit of time left before bed, maybe I can do something more.